Not to mention the return of Harry's ex-girlfriend Susan, still struggling with her semi-vampiric nature. And who seems to have a new man. Some days, it just doesn't pay to get out of bed. No matter how much you're charging. 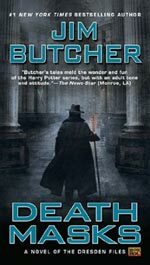 Death Masks is the fifth of Jim Butcher’s Dresden Files novels featuring protagonist Harry Dresden – Chicago’s only professional wizard for hire. As someone who thought they had read the entire series (currently standing at a total of thirteen books at the time of this review) imagine my joyous surprise when I discovered a Dresden Files book that I had missed while mooching in the SF/F section of my local book store. Surprising, because (as regular LoveVampires readers will have already realized) I’m a stickler for reading serial novels in strict order. Joyous, because finding a book you haven’t read by one of your all time favourite authors is always a happy occasion. Death Masks is classic Dresden Files. The opening pages see Harry challenged to a duel by Duke Ortega, the Red Court’s top vampire warlord, under the guise of ending the war between the Red Court vampires and the wizard’s White Council. Harry’s motivation to take part? Duke Ortega will kill all his friends in Chicago if he doesn’t… From there the story rockets along at a great pace as Harry is commissioned to recover the Shroud of Turin, stolen from Italy but rumoured to be in Chicago, while gruesomely murdered corpses start to turn up in the city. Throw in a visit from Susan, Harry’s not-quite-ex-girlfriend, and he’s in for a difficult few days while trying to sort the whole lot out. The story’s pacing is fast, the action just about non-stop and the mystery is satisfyingly obtuse. As with all of Harry’s investigations readers get to see Harry drop some pithy one-liners even as he gets beaten up by dark forces much stronger than himself. And if he briefly gets the girl he certainly doesn’t get to keep her – such being the established pattern of Harry’s love life even this early on in the series. However for vampire fans Susan is the star of this show. Infected with the Red Court’s vampire virus, yet struggling to not give in to her bloodlust so that she can remain human, Susan channels her vampiric powers into great strength and in the fight scenes she upstages Harry’s monster fighting abilities with ease. Her character and her relationship with Harry also adds an emotional depth to Death Masks that would otherwise be lacking. Death Masks has a wonderful mixture of monsters and mythologies which combined with it’s classic noir PI protagonist make it a more-ish treat for urban fantasy fans. Highly recommended reading. 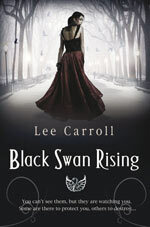 You can find out more information about the other books in the Dresden Files series, plus read the first three chapters of this book on the author’s web site. Visit Jim’s site.